In this article, you’ll discover findings from studies to help you determine what consumers want to see from you on social media. 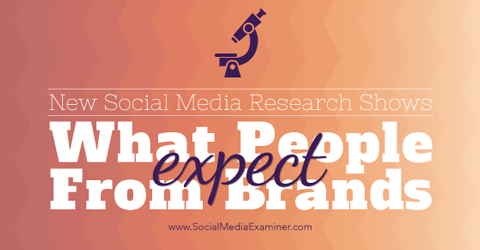 Check out new research to find out what customers want from brands on social media. #1: You Better Be on Facebook! Inbound marketing leader HubSpot asked 569 customers what social media presence they expect of any brand. In The Social Lifecycle: Consumer Insights to Improve Your Business, consumers report they expect brands to be active on at least three to four social channels. It can come as a shock that consumers expect brands to be engaged on at least three social media channels. 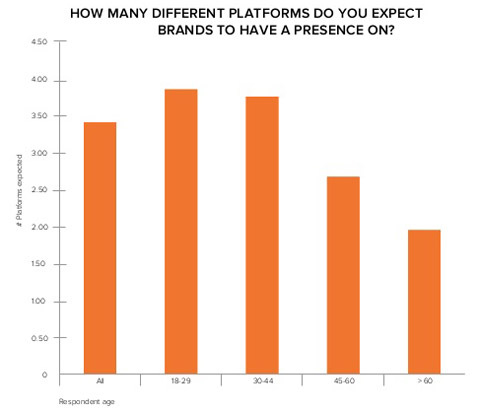 Specifically, 95% of Millennials expect brands to have a Facebook presence. Also, 87% of Gen X’ers (30- to 44-year-olds) and even 70% of those ages 45 to 60 think brands should, at the very least, have a Facebook page. While consumers reduced expectations by about 10% for Twitter presence, they dropped expectations even further for Instagram, LinkedIn, Pinterest, YouTube and Google+. Only about 50% of those polled expect brands to have a presence on these social media platforms. Consumers take for granted that a brand will have Facebook presence. Social channels are a sign of a company’s dedication to transparency, accountability and even customer service! Customers recognize this and expect to see a brand engaging with customers on Facebook. Even though “silent” customers may not add comments or likes (basically, VALUE) to a brand’s Facebook page, still . . . they’re watching. Brands’ social media channels leave them open to consumer criticism. American consumers know this and therefore have more respect for companies that encourage feedback and respond in a timely and thorough manner. What do customers want from companies on Facebook? If customers expect a brand to be active on Facebook and possibly two or three other social channels, the next question is, what do they want from companies there? A good way to determine this is to examine which companies have the most loyal social media following. 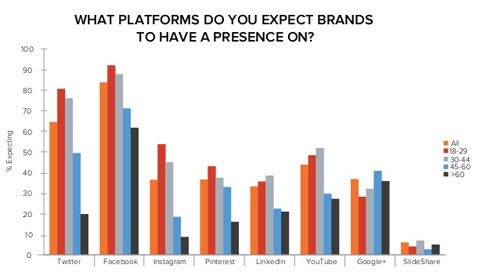 LoudDoor’s August 2014 study, Top 20: Brands with the Most Loyal Fans on Facebook, gives us some insights on what motivates consumers to take time from their busy schedules to become brand advocates. Who are these “Top 20″ brands and how did they make their fans so engaged? The top 20 brands with the most loyal Facebook followers from LoudDoor. Costco (1.2 million fans): Deals on items consumers need. Ziploc (1.5 million fans): Holiday recipes like cakes encrusted with peppermint sticks crushed in Ziploc bags? Crafts and holiday decorations stored in . . . you guessed it . . . Ziploc containers. St. Jude Children’s Hospital (1.7 million fans): Photos of children getting better. Medela (247,000 fans): Baby photos and information to support breastfeeding. Tide (over 4 million Facebook fans): Featuring the Scott twins, also known as the Property Brothers. Focused on clothes that can get really dirty like military, janitorial, construction and firefighting uniforms. Reese’s Candy Company (12 million fans): Interesting desserts incorporating Reese’s products. Peanut information. People respond to things that are relevant to them. Understanding the passions and interests of your advocates guides your understanding of what interests your most passionate consumers. When brands deliver entertainment and enrichment on social media, they are rewarded with brand advocates and consumer goodwill. In this era when brands must skip direct selling and rely on brand advocates to market for them, social media channels should only tangentially touch upon a brand’s products and services; instead focusing on customers’ needs. In their 2014 State of MultiChannel Customer Service report, researchers at Parature (a Microsoft company) asked 1,000 consumers whether they ever asked a customer service question via social media. Thirty-five percent responded that they had. Of these respondents, 51% reported that the brand’s response gave them a “somewhat more” or “much more” favorable view of the brand. 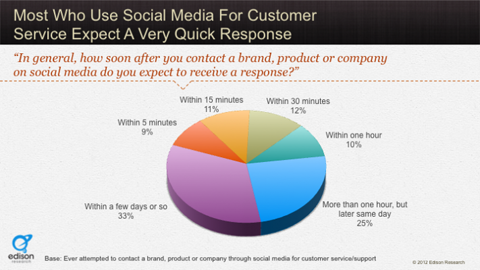 Parature found that 35% of consumers surveyed have asked a customer service question via social media. Additionally, the HubSpot report mentioned in #1 above confirms consumer reliance on social media for communication with a company. Of the HubSpot study’s 569 respondents, 50% reported they’d complimented a brand in the past 5 months, 35% complained about a brand and 30% requested support. Many populations, including those over age 60, are using social media to connect with companies to express their gratitude, get guidance or satisfaction. 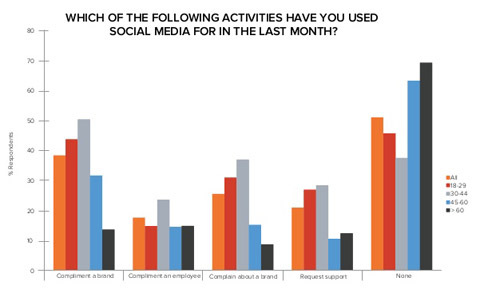 Consumers used a brand’s social media channels to compliment, as well as complain and ask questions. In the beginning of the social media revolution, many brands resisted establishing social media channels due to a fear of negative comments. The HubSpot study finds that consumers reached out on social media to compliment a brand more often than to criticize it (50% vs. 35%). An Edison Research study found that not only do consumers expect companies to have social media channels, they expect them to be ready to respond quickly there. Forty-two percent expect a response in under an hour, 25% in the same day and 9% want it in 5 minutes! Edison Research reports that consumers now assume that a customer service representative is on the other end of the social media channel, ready to respond to a question, complaint or compliment, fast. Smart brands leverage consumers’ comments, compliments and even criticisms on social media to strengthen the brand’s image. Provide an easily accessed customer service and communication channel via social media to add to a brand’s credibility. People do not go to social media to promote or be promoted to. They go to connect with friends, be entertained or enlightened and have fun. In the Social Lifecycle study from HubSpot, consumers admit that if there’s a product or service they need, the best place for businesses to reach them is through email marketing. Facebook is a distant fourth. LinkedIn and Twitter landed in fifth and seventh place with negligible numbers. Gallup even goes so far as to state that companies betting on social media to boost sales will be disappointed. 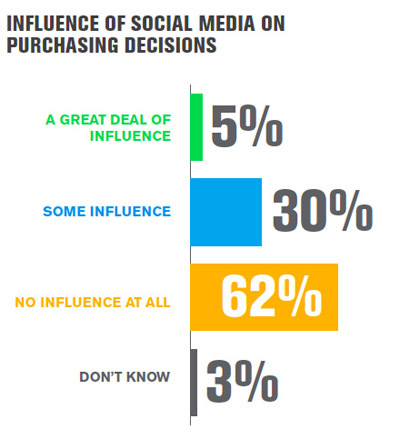 The majority of Gallup’s 2014 State of the American Consumer respondents report that social media has no influence on purchasing decisions. This reluctance to discuss purchases on social media even extends to consumers who bought items online. In other words, those who are comfortable buying and interacting online are still reluctant to discuss what they buy and why. Despite the potential for connection with consumers social media seems to offer, consumers are there to interact with other people rather than brands. Social media is not an ideal channel for selling. In 2014 customers don’t use social media to buy. That means brands must be in the entertainment business to some extent, delivering helpful and even interesting content. It’s through this helpful and interesting social content that brands tell the story of their own identity so customers can determine whether they share values with the company. Getting customers to develop affinity with a company turns them into the “fully engaged” customer. Gallup recommends companies shoot for this in the customer-centric economy. Our data reveal that a customer who is fully engaged represents an average 23% premium in terms of share of wallet, profitability, revenue, and relationship growth compared with the average customer. In stark contrast, an actively disengaged customer represents a 13% discount in those same measures. Fully engaged customers have a strong emotional attachment to a company. They act as brand ambassadors for this company, rallying on its behalf to friends, family, and coworkers, and going out of their way to purchase its products or services. Some might even say that they love that company. Social media is an ideal place to foster and nurture emotional connections with consumers and to prove to that customer that the brand’s values are aligned with theirs. In 2015 the most successful brands will use social media to carry their values and identity into the news feeds, hearts and minds of their social media audiences—not details of their specific products or services.